Photo of the day: Sinh To Round 2 @ Five Boy Number One. Photo credit: Aaron. We decided it’s time for more smoothies, so we took a nice stroll to the Five Boy Number One stall again. On our way there we encountered a weekend market full of merchandise, food and music. Once at the smoothie stall, I was quite conflicted whether to try a new flavour or sticking to my favourite avocado and coconut flavour from last time. I decided to get that again and let Aaron try something new. He choose the red dragonfruit with mango. He seemed to really enjoy it but it was a little on the sour side for me. Next, we went to a hipster cafe called L’USINE. We did some trip planning while I enjoyed some iced lime soda. It was quite refreshing I would have to say. It came with syrup which was perfect since I could choose not to add too much of it. I need a sugar hiatus from all the over-sweetened drinks here. For lunch Aaron wanted to try something different. He brought us to a restaurant called Banh Trang Trang Bang Hoang Ty. 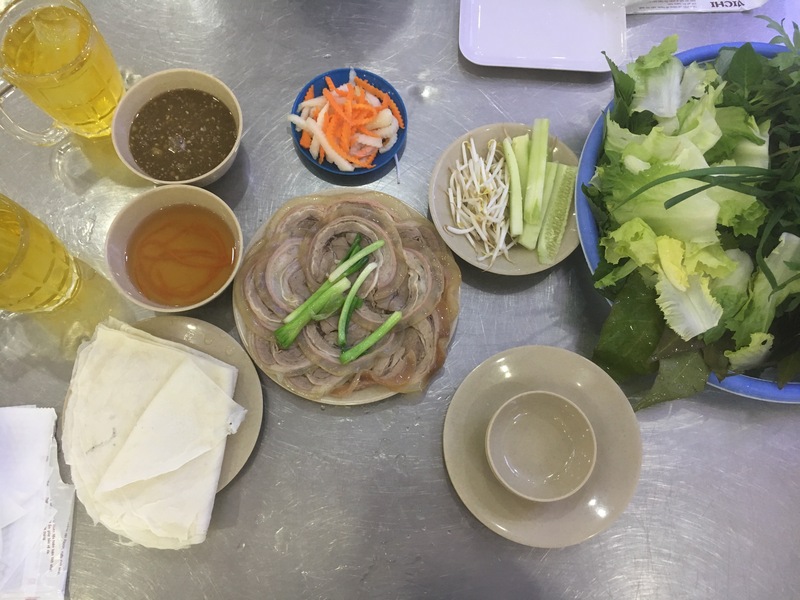 It was apparently famous for its rice rolls originating from the Trang Bang district in the southern part of Vietnam. 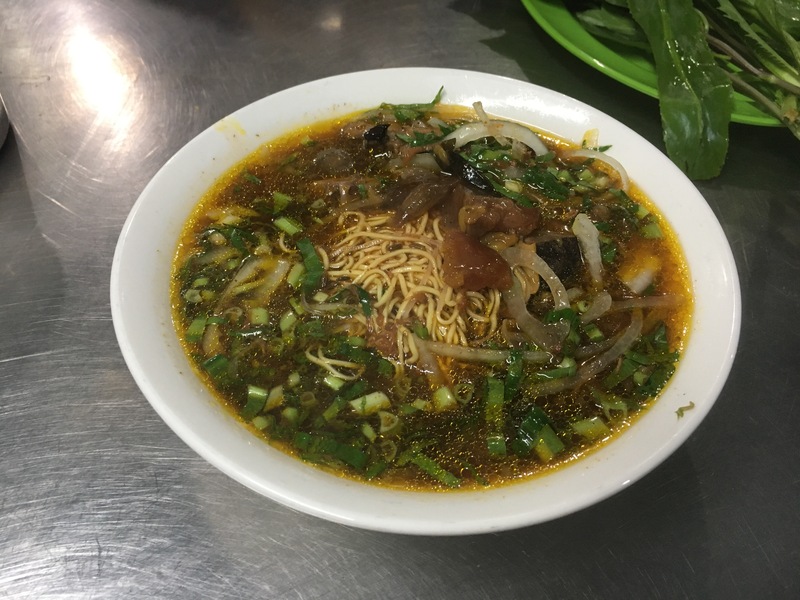 We figured we should be eating more southern Vietnamese foods now as our time here is coming to an end. We just randomly pointed to a line on the page with platters to make rice rolls and the server guided us to order something else. What arrived looked like what everyone else ordered so our server did a good job in helping us make the right choice. Similar to the Bo La Lot from the other day, presented in front of us was a large plate of veggies, some meat, pickled veggies, some wrapping paper as well as dipping sauce. The paper was different though. It looked and felt like the paper we would use to make fried spring rolls. I questioned whether it was ok to eat raw but looking around everyone was eating it, so I questioned no more. I assembled everything like I did with the Bo La Lot and dipped it in the same delicious sauce. The star of this dish is the meat, which I believe was pork slices. Overall less tasty than the Bo La Lot. I also did not enjoy the taste of the wrapping paper as much. It was a costly meal ~$13 and I did not feel that it was worth paying the higher price. After the museum visit, Aaron met up with a friend to do some work, while I headed back to the airbnb to get some rest. I originally wanted to pay a visit to the Xa Loi Pagoda but I am still trying to recover from this virus. I ended up reading up some more about the war before dozing off. Still not feeling too well, we decided to grab some comfort food before calling it a night. We Ubered to a good Bo Kho (beef stew) place. Their menu was simple AM: Pho, PM: Bo Kho; oh yeah, and ginseng drink and seaweed if you so please. We both ordered the Bo Kho with noodles. They weren’t too busy as there was only one other party there before us. Once we got our noodles, we realized that we had the last two bowls of the day! How lucky of us! The broth was super flavourful and worked so well with the egg noodles. You can also choose to eat it with Banh Mi (bread) but we chose not to. There were beef brisket and tendon pieces to accompany the noodles, as well as a more reasonable side of veggies. Overall tasty but too much coriander/herbs added for my taste. Another thing I wish they had was carrots! Perhaps they have ran out since it is the end of the day? With our cravings satisfied, we headed home to get some rest.